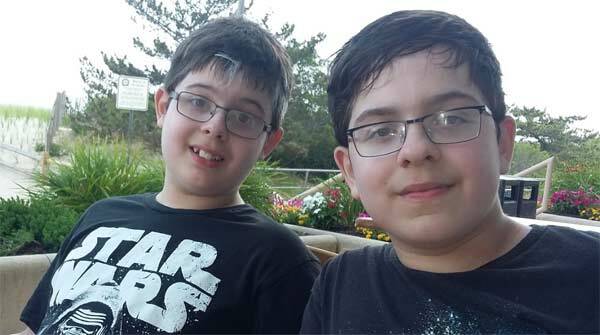 I’m so proud of my sons Ben and Nate! Today, they each had a math test. (same grade / class / teacher, different periods). There were 21 questions on the test. Nate got two wrong, but Ben said he got 100%. Great. But after I asked Nate about the two questions he got wrong, Ben stopped and asked if one of the questions was number 12. I stopped him, and asked Ben why he asked. If he got them all right, why would that one stick out? Ben said that he got that one wrong, but did the calculation three times, and each time he came up an answer different than what the teacher had said. When asking about it, the teacher took another look and indeed, the wrong answer had been indicated on the answer list. THEN something popped into my head. I asked the brothers who had the class earlier. If Ben had made the correction in an earlier class, then Nate’s error would have stood wrong. But it turns out that Ben’s class was after Nate’s – so having missed question 12, Nate got a 20 / 21. But was was more outstanding was that Ben has math class the last period of the day. In other words, every other student in Ben’s grade failed to pick up on the error as Ben did. Potato Pancakes in a Can – DID THEY EVER EXIST? This last Easter / Passover we were looking at the supermarket fliers and I saw some of the Kosher selections which I remembered from when I was a kid. Carol pointed out a can of some kind of cucumbers which looked terrible and we asked how anyone would ever want to buy them. I figured it would be someone who remembered them when they were a kid. As opposed to animal or mineral pancakes? Then I remembered having these canned potato pancakes. To make them, you opened BOTH sides of the can and pushed them out of the can. As you pushed, you cut them off in perfect circles. You then fried them. I remember liking them, and asked Carol if they had them. Nope. 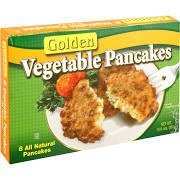 They have frozen potato pancakes (aka latkes) and some kind of mix in a bag, but not the CAN. Searching the store’s website, then google, I was not slightly surprised that there is ZERO mention of this product having ever existed! Well, this post is here for you, canned potato pancakes. Ben’s Team Wins the Woodbury Math Olympics! 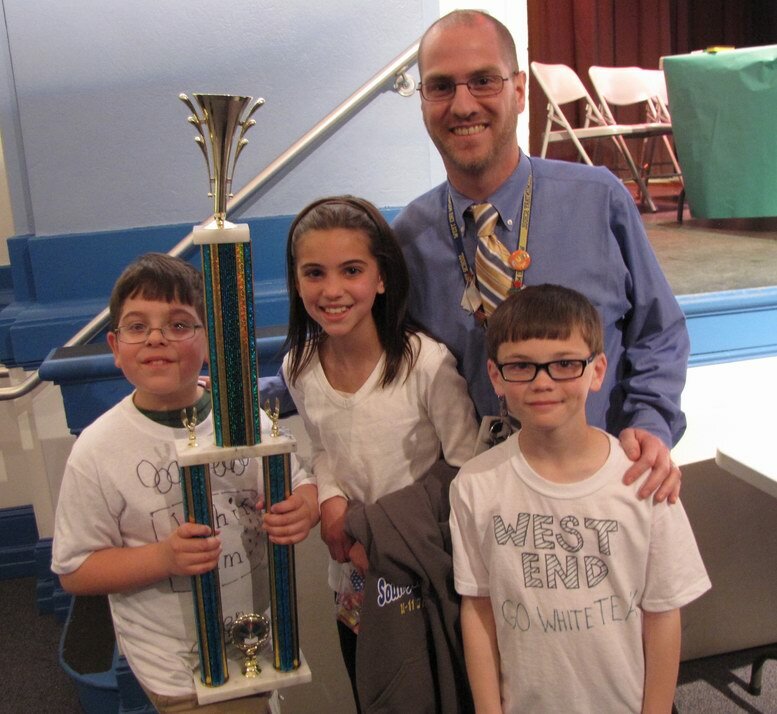 I can not be more proud of my son, Benjamin (and his team), for winning the 2013 Math Olympics!! All possible and imaginable rights reserved and non-transferable without express written permission. Don’t tell Carol! My son’s disgusting taste. Oh my God. My hands tremble as I type this, because while Carol was working late tonight, I decided to let Nathaniel try the food that he asked for. If it was only eating habits, I would swear Nate wasn’t really my son, because he is just about the most picky eater I’ve ever known. Tonight I made spaghetti. Ben likes “the red sauce” that the rest of us eat. Carol, due to her half-Italian upbringing calls it “gravy”. I don’t call it “gravy” because in my book, to be “gravy” it should have some meat in it. Nate doesn’t like tomato sauce, however, even though he likes tomato catchup and pizza. IN FACT he likes CATCHUP ON PIZZA. And that’s where we’re going. When asked if he wanted his spaghetti as he usually does, just with butter, because Mom wasn’t here, he was bold enough to ask for his spaghetti WITH CATCHUP. 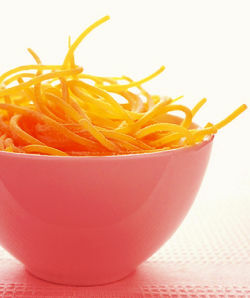 Totally grossed out, I made a very small bowl of spaghetti and squirted some catchup on it. TO MY HORRORS – HE LIKED IT. May God forgive me, because I know Carol won’t. What the hell is the message here? It’s better to send a card to your parent than to visit? A card is better than being with someone you love? It seemed to me that Hallmark was putting down the visitor because she had to leave and suggesting that cards were better. Subtle, but nonetheless disturbing to me. What totally mystifies me are people giving cards even though they go to see the person (like to a birthday party). I mean, we go over to my in-laws (my parents happen to be dead, the story would be the same, however) and we give them a card for their fill-in-the-blank occasion (that’s in addition to a present if it’s their birthday for example). But since WHEN (cough*HALLMARK*cough) has “the card” become (part of) “the present”? What a racket. Then to add consumerism to injury, the recipient, seemingly right out of the commercial, ceremoniously reads the damn out-of-the-box poem / saying as if the giver wrote that pap themselves. I like to give cards, but you should give cards for those times YOU will be there. I honestly don’t care, dear reader, if that’s always been the case in your limited experience, I’m saying it DOESN’T MAKE SENSE. *HALLMARK* *WANTS you to consider this some half-assed “tradition”. BREAK THE CYCLE! FIGHT THE SYSTEM! AND STOP GIVING CARDS FOR EVERY DAMN THING. 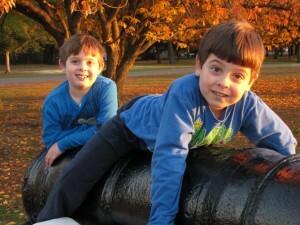 Thanksgiving Day cards? HALLOWEEN CARDS? Oh come ON! PEOPLE: TAKE BACK OUR CULTURE FROM THE MERCHANTS! Yes, they still make Jiffy Pop. No, they haven’t improved it. It still burns. 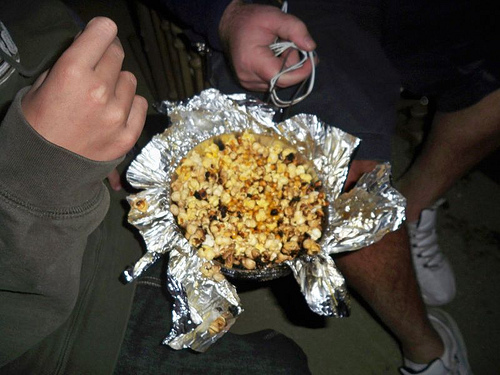 Everyone, at some time, has a Jiffy Pop moment. Who can forget the time when they saw the silver foil grow from a flat disk into a giant dome! What innocence. The only thing was that, as far as I could ever tell, it was virtually impossible to make the damn popcorn without burning it. Guess what! TIMES HAVEN’T CHANGED! 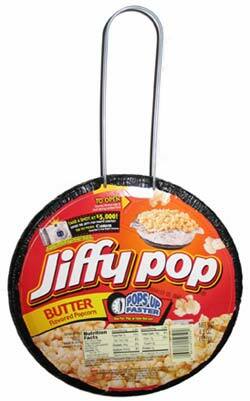 Did anyone EVER get GOOD POPCORN out of Jiffy Pop? But times move on, I thought. I figured, Orville Redenbacher has come and gone and has left us with near-perfect popcorn both on the stove and in the microwave (you could consider that an endorsement). So, how complicated can corn be? I mean, is there any shortage of MONEY in making processed corn that they couldn’t make it, well, GOOD? Apparently so, because being otherwise required to relive my childhood through the eyes of my sons, I felt somewhat compelled to buy the way over-priced Jiffy Pop (really, $2.60 for what, 20 cents worth of popcorn and some foil?) and share “the experience” with them. NOT DISAPPOINTED. I expected something pretty bad and it delivered! Maybe the best childhood memories aren’t always the sweetest. I remember trying to make Jiffy Pop when I was young but failing to make it look and taste as good as it looked on the TV commercial (as countless other toys and cereal promotions ended up disappointing me – damn you Lucky Charms! You call THAT a “puppet”!??). The circle is complete. It was crap then and it’s still crap. The good news: They still make Jiffy Pop the same way they’ve always made it. The bad news: They always made it BAD. Who says you can’t go back home. 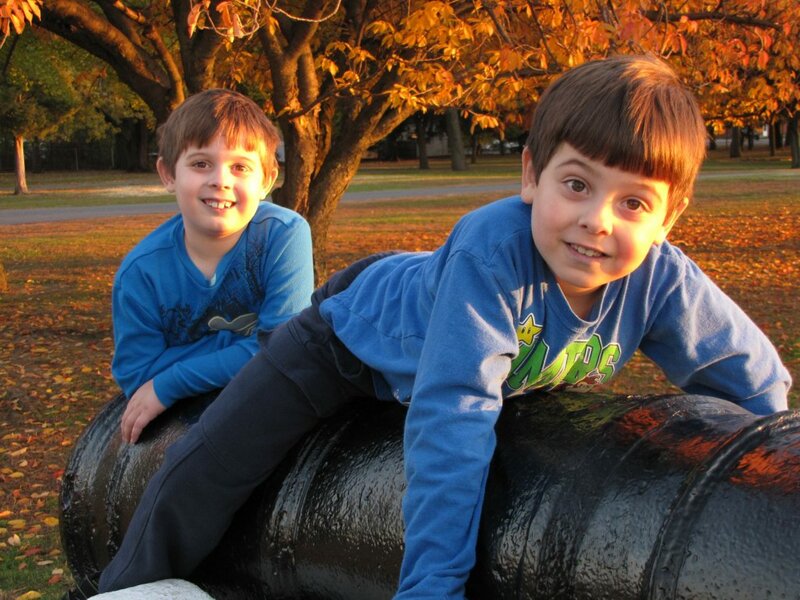 Thanks to Jiffy Pop I was able to share at least one burned kernel of truth with my boys. Did Kill-A-Watt Fry My Microwave? 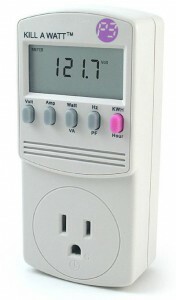 I bought one of these Kill A Watt gadgets which tells you how much energy a given appliance uses. This is especially useful when you want to know how much an appliance uses when it’s not turned on. My results have been very modest, btw. When it’s not on, my Dell computer, for example, along with its ISO-Bar uses a combined 3 watts. I can live with that. So, after having ‘played’ with the Kill A Watt for a few times, to satisfy some curiosity, I parked it on the kitchen table to take downstairs the next time I go. My boys asked me what it was and I had to go into the whole speech about how things use electricity, and that electricity isn’t free, etc. So, in order to demonstrate to them how it worked, I plugged in our Panasonic microwave oven. Well, I don’t know what happened. When I plugged the oven with the Kill-A-Watt in, it was using 3 watts. I explained to the boys that when I turn the microwave on, however, they can expect that number to go up really high. I turned the microwave on, but to my surprise, the Kill A Watt showed numbers changing every SECOND, up and down, sometimes going to 1,950 watts (it’s a 1,250 watt oven) and while the boys were losing interest, I stopped the “demonstration”. That was enough of that. Only, after I plugged the microwave straight back into the wall, it didn’t work. The clock worked and the ‘menus’ worked, but when I went to run it, it ran for like one SECOND then shut off. Today, I’ve bought a new one for $143, rather than waste two afternoons of my time plus the time I wouldn’t be using a microwave, plus at least $80 in order to get the old one fixed and who knows if the repair would really fix the problem? If you want to know how the ‘disposable society’ is made, that’s the answer – that the VALUE of repairs often exceed the VALUE of getting a new one. If they made such things in a way that they would be cheaper to repair, or that we could repair them ourselves (and would you really want to “play” around with a MICROWAVE OVEN?) then maybe I woudln’t have been drawn into my decision. But now I’m scared to use the Kill A Watt on anything of value. I wonder if this was just a coincidence, a “bug” of some kind just for microwave ovens or even just Panasonic microwave ovens (which boasts a special “inverter” circuitry). I’ll let you all know if something more happens! Follow up: I have made contact with the guy at Research Associates who has one of these. Seems to be a real electronic whiz. Said he never had a problem. Maybe it was NEVER the way it used to be! People have told me that it used to be called The Berlin Auction, and they had actual auctions there, but that was before my day. For me, I have many memories at The Berlin Mart in Berlin, New Jersey. I’ve gone there, on and off, for many years, even in the Winter. It’s managed to survive many decades now, and while some things have changed, many things remain. I apologize in advance for not having taken any pictures on my last trip there with Carol and the boys, but I was saddened during my last trip enough to say that it’s going to be a long time before I make the trek out there again. The Berlin Mart Sensory Overload Experience is STILL there! 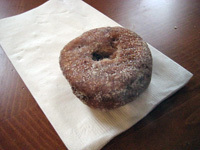 The last donut from the Berlin Mart from the batch we bought. STILL YUMMY! TO BE FAIR, and because many people often don’t read further than the first few paragraphs, I’ll put the good news FIRST. I am glad to see many of the ‘old’ stores and experiences are STILL THERE. After having gone up and down the isles of disappointing flea vendors, see below, we went toward the South entrance. Past an electronics shop in a barn affair, there is an apple cider vendor and the donut shop. Now, this donut shop is the rinky-est, dinky-est little shack you’ve ever seen, but people STAND IN LINE for these donuts. There’s quite a selection too! Sugar Cinnamon and Glazed. While they are BAD for your diet, (I’m guessing each donut has at LEAST 2 teaspoons of oil) they are HEAVENLY. ENTERING THE BERLIN MART – The South Side Whammy! Help the Economy! 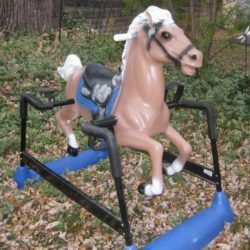 Buy me this thing! 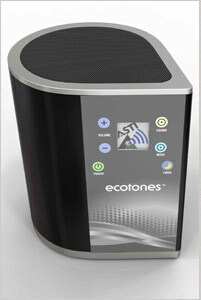 Today‘s New York Times tells us of a new kind of sound machine from Ecotones. Sound machine? OK, they’re not for everyone but there have been sound machines like this (though not as fancy) for years and years. We bought one for our boys when they were babies an used the “heartbeat / swoosh” sound to keep them sleeping. I don’t know if it helped, but I can say that I use an old one with a ‘thunderstorm’ sound that does a great job of hiding the traffic sounds outside. Well this baby adjusts its soothing sounds according to the sounds it can hear. So, if a truck goes buy, it automatically increases the volume to ‘cushion’ the abrupt sound of the disturbance! I know I’m a bit of a kook, but if you have trouble getting or staying asleep, I’ve found these types of things to be better than a warm cup of milk! We live on a very busy street. I could practically jump out of the bedroom window and onto the top of a passing truck, Steven Segal style. These good old boys come barrelling through trying to either make the light going one way, or making up for time lost at the red light coming from the other way. Only moving to another house is going to solve this problem, because as it is the only viable route between West-South Jersey to points East to the shore (via the Atlantic City Expressway or the Black Horse Pike) is passing in front of my house. Oh, did I mention? They want just under $300 for this thing! What a great gift – TO ME! I’d even send the giver a nice “thank you” card! Congrats, Music Companies! Scientific Proof You’ve Ruined Music! Students were asked to judge the quality of a variety of compression methods randomly mixed with uncompressed 44.1 KHz audio. The music examples included both orchestral, jazz and rock music. When I first did this I was expecting to hear preferences for uncompressed audio and expecting to see MP3 (at 128, 160 and 192 bit rates) well below other methods (including a proprietary wavelet-based approach and AAC). To my surprise, in the rock examples the MP3 at 128 was preferred. I repeated the experiment over 6 years and found the preference for MP3 – particularly in music with high energy (cymbal crashes, brass hits, etc) rising over time. In other words, the present and future consumers of music now prefer inferior sound quality! First, crappy music (yes, I said it) and now crappy SOUNDING crappy music! What’s next? Have them pay for something they don’t use? Well Comcast has beat you to THAT! My TiVo crashed and I found a great thing! I’m pretty comfortable with computers and replacing hard drives. I’m also comfortable with burning CDs. If this neither describes you nor anyone you know, then you may just want to skip this. You may or may not know that such a subscription is NOT transferable to any other TiVo, so it makes my box somewhat precious. OK, 2 years ago I checked out this addon kit from http://www.weaknees.com which added 160gb to my 40gb for a total of 200gb. I know I’m going on and on about the Wii. But here’s my first article after having had the thing for a week, some experiences with its Nintendo emulation and about my trip to my local GameStop. I must say up front that I’m still quite satisified with my Wii. While I’ve seen much better graphics on other consoles, the motion controlled features of the Wii remotes make it, well, another thing altogether. I should say that, if I had the money that another $300 wouldn’t matter, I’d get the Xbox 360 AS WELL. You read that right. What’s up with getting a Wii? I’m a little confused. If you want to 1) stand in line for 4 hours, literally in the rain at 4:00 am, 2) make dozens of phone calls or 3) pay outrageous premiums in order to buy from disreputable dealers, YES, you CAN find and buy a Nintendo Wii! Now, if I want to buy an XBox or a Playstation, no problem. They’re the same price everywhere and available from any number of sources including Walmart, BJ’s and Sam’s Club. But what’s the deal with the Wii? I mean, do they WANT me to buy one? Don’t they realize that every WEEK that passes by their initial rollout is one week more that I’m thinking about the added features of an XBox or hi-def DVD player in a Playstation? My 13 month old twin boys sure are growing! They can now reach up to the table where we keep the diaper changing stuff along with the vaseline! At least that’s what I found out today! OK, my pediatrician says to call 1-800-poison-1 (good to remember!) and THEY say that, as long as they didn’t CHOKE on it, it’s perfectly safe. Thank you Evil Trial Lawyers! That’s not being sarcastic, either! Tonight, while having dinner with my pregnant wife, we were discussing the various things we would need for our twins. One thing on the list were baby seats for the car. I have enough problems shopping for a new hard drive. Getting a TiVo (expected tomorrow!) has been a major move around here. So now we need this thing(s) that 1) we will entrust the lives of our children with and 2) will stop using in less than a year. It is as I feared, but the kinda-famous monologist Spalding Gray was found dead after weeks of not being found. The story of his missing and now of his death are easily found, but at this time, I wish to share my personal experience with his work. While Gray appeared in many movies, including a couple which set to capture his live monologues, these films did not succeed, in my opinion, to capture the energy and talent that he projected in a live forum. The closest he came to capturing the experience were a couple of PBS specials he made – the best one used a single static camera pointed at him. In it, he sat at a desk with a shuffled stack of cards. He revealed each one showing the title of one of his stories and that’s how the show went. The other show was more of a show as it used actors to illustrate the story of his buying a home. The voice over style that was applied was very reminiscent of the stories of the late Jean Shepherd whose work was immortalized in The Christmas Story, It Runs In The Family, and numerous other PBS specials. One movie “Swimming to Cambodia”, which is available on home media (DVD, VHS) started out like one of his monologues, but digressed into a distracting series of sound and lighting effects, none of which were in his live presentation. Compared to Shepherd, Spalding Gray’s work was more introspective and bordered on the self indulgent at times. He only tried to be funny at times, and resisted attempts at being funny, (although his monologue about buying a house was hilarious) which made his humorous stories only more so because of their honesty. Gray was the victim of a terrible car crash, which crippled him and threatened his career as an actor. It seems he never got over it. He attempted suicide, but came back from it. It seems this time, after having seen the movie “Fish Story”, he gained a sense of peace and developed the courage to do it again. 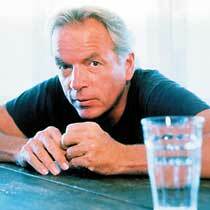 Knowing that we will never see any more from Spalding Gray, he will be missed. Sometimes, people have to learn the same old lessons over again. When Intuit released it’s 2003 version of TurboTax, which is the most popular package for self-preparers, they listened to the likes of Macrovision who sells software classified as “digital rights management”. WIRED: Hungary’s Xupiter ‘toolbar’ acts more like a VIRUS! In Wired Magazine, (see extended text for link) it is reported about a “toolbar” utility which installs itself in your web browser and acts more like a virus than anything else. The Wired story, reports that Xupiter.com has created a applet which, when installed without permission, does everything from change your search page to your home page and perhaps reports on every website you visit! Insidious in nature, Xupiter has offered an ‘uninstall’ utility which some have reported having crashed their system! The utility installs after a false message box pops up (you just LOVE those pop ups, don’t you?) and, thinking you’re closing the damn thing, you actually activate it! It also appears that Xupiter may be selling its “service” to other websites, so beware!